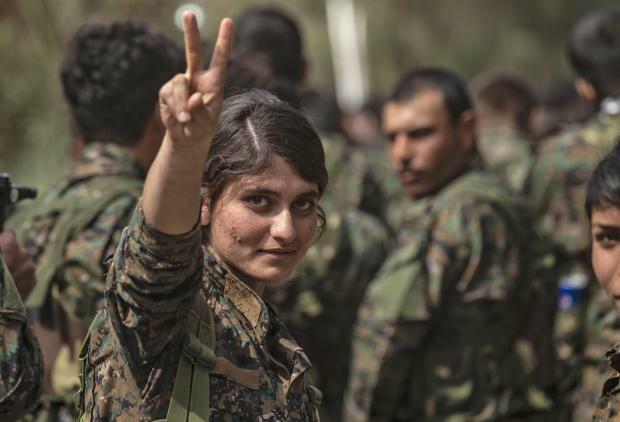 A female fighter of the US-backed Kurdish-led Syrian Democratic Forces (SDF) flashes the victory gesture while celebrating near the Omar oil field in the eastern Syrian Deir Ezzor province. Kurdish-led forces pronounced the death of the Islamic State group's nearly five-year-old "caliphate" Saturday after flushing out diehard jihadists from their very last bastion in eastern Syria. The SDF's victory capped a six-month operation in which it took heavy casualties and will go down as a symbolic date in a war that changed the face of the region and spurred a spate of global terror attacks. "Syrian Democratic Forces declare total elimination of so-called caliphate and 100 percent territorial defeat of ISIS," spokesman Mustefa Bali said in a statement, using another acronym for IS. The nearly five years of fighting against the most brutal jihadist group in modern history left thousand-year-old cities in ruins and populations homeless. 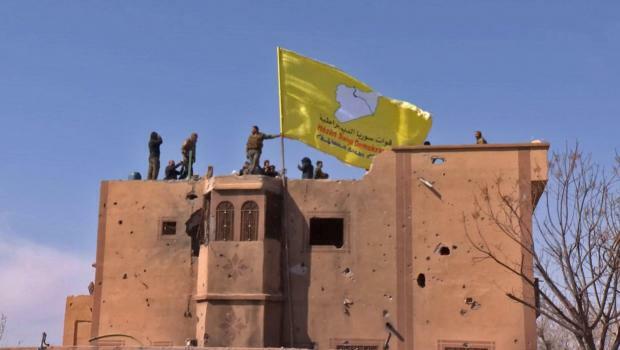 An image grab released by the Kurdish Ronahi TV shows the US-backed Syrian Democratic Forces (SDF) raising their flag atop a building in the Islamic State group's last bastion in the eastern Syrian village of Baghuz. The territory administered by the remnants of IS continued to shrink month after month and in September 2018 the SDF launched a final offensive on the last dregs of the "caliphate" in its Euphrates Valley strongholds. "Those who lasted the longest were mostly foreigners... Tunisians, Moroccans, Egyptians," Hisham Harun, a 21-year-old Kurdish fighter, told AFP shortly after the SDF's yellow flag was raised. Around him, the former jihadist encampment was littered with bullet-riddled truck carcasses, discarded suicide belts and the torn tents where the caliphate's last families sheltered for weeks. Kurdish officers and aid groups were flummoxed by the number of people who had remained holed up in the last IS redoubt of Baghouz, a small village even few Syrians had ever heard of until this year. As SDF forces pummelled IS positions and US warplanes dropped huge payloads on the riverside village, tens of thousands of people fled over a rocky hill and trudged through the plains in biblical scenes. For weeks, the ghostly figures of the caliphate's last denizens hobbled out of the besieged village, famished, often wounded but sometimes still defiantly proclaiming their support for IS. The Kurdish-led force and foreign intelligence screened more than 60,000 people since January, around 10 percent of them jihadists turning themselves in. Most of the people evacuated from the smouldering ruins of Baghouz in recent days were relatives of IS members who now fill overcrowded camps further north in Syria's Kurdish-controlled region. The biggest of them, Al-Hol, is now struggling to host 74,000 people, including at least 25,000 school-aged children. Among them are thousands of foreigners from France, Russia, Belgium and 40-plus countries that are in most cases unwilling to take them back. "The needs are huge and the camp is overwhelmed," Peter Maurer, president of the International Committee of the Red Cross said Friday upon returning from a five-day visit to Syria. While the SDF taking Baghouz marks the end of the IS "caliphate", the jihadists still retain a presence in eastern Syria's vast Badia desert. They also have hideouts in parts of Iraq as well as sleeper cells capable of carrying out the kind of deadly guerrilla insurgency that accompanied the rise of the Islamic State group. IS fighters who escaped the shrinking rump of the "caliphate" in time and reorganised their group are already re-establishing their former sanctuaries in Iraq. Even the Pentagon has warned in a recent report that the absence of sustained counterterrorism pressure on IS would allow the jihadists to reclaim some territorial control within months. John Spencer, a scholar at the Modern War Institute at West Point, warned that while the geographic caliphate had been dismantled, IS was far from defeated. IS "is a terrorist organisation, all they have to do is put down their weapons and try to blend in with the population and just escape," he told AFP. "They're not gone, and they're not going to be gone."